ANTANANARIVO, Nov 25 2010 (IPS) - The Nosivolo River has the greatest concentration of freshwater fish species in Madagascar. Strengthening protection of the river’s biodiversity has involved transforming the livelihoods of local people. Species that were on the road to disappearing are now regaining strength thanks to strict regulations adopted – and enforced – by fishing communities to protect them. The river, which tumbles spectacularly from its headwaters in mountains 1800 metres above sea level through cascades and over waterfalls to where it joins the Mangoro River. No fewer than 19 fish species endemic to Madagascar are found in the Nosivolo, including four that are found only in its 130 kilometre length. 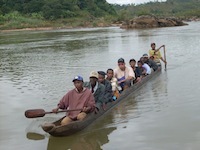 Conservation and International and Durrell Wildlife Conservation Trust came to Marolambo, on the Nosivolo River in 2003 to work to protect this biodiversity. Seven years later, their scorecard is postive. The practice of “tavy” – clearing land for rice farming using slash and burn methods – had caused heavy erosion of the hillsides, leading to increased turbidity and siltation in the river, according to Benoît Lahimarina, former MP for Marolambo. “Residents have begun to be aware of the importance of preserving (the environment) and are progressively putting in place new cultural practices,” he told IPS. “To protect the fish and their habitat, it is first necessary to help people,” says Hasina Randriamanampisoa, communications officer for Durrell. The support from Durrell and Conservation International was directed primarily to the construction of community infrastructure such as water standpipes and schools, as well as the financing of numerous micro-projects to generate revenue. Many former fishing families have now become farmers, herders, beekeepers and artisans. The river and its catchment area were recognised as a wetland of significance and declared a Ramsar Site in September, in recognition of the importance of the ecosystem and its biodiversity. “The riverine populations themselves have established strict rules for conservation,” says Rakotoniaina. Organising communities into several associations, they have put in place rules forbidding fishing in certain parts of the river and regulating the fishing season. “Where the fishery is closed to fishing for according to the official rules, the riverine associations of Nosivolo have extended this period to four, even five months,” he says. “The regulation of the mesh of fishing nets is also more strict than is set out in the law,” says Luciano Andriamaro, coordinator of scientific programmes for Conservation International Madagascar. To help ensure respect for the rules, the associations have also turned to an officer from the forestry administration in their district. Joint control teams, made up of representatives of the local authorities and community members have been put in place. “The local authorities are very cooperative,” says Randriamanampisoa. The results of these diverse conservation activities have been immediate. “The fish that were in critical danger of extinction are a bit more numerous in the river and its tributaries, and people have noticed that they are also bigger than before,” said Andriamaro. She underlined that despite the tangible changes on the ground, the status of threatened species has not yet changed enough to have them removed from their place on the IUCN status. The changes are opening up the remote area around Marolambo in some unanticipated ways. “Young people in Marolambo laid eyes on a car for the first time in 2006. For want of passable roads, no cars had come to the district since 1972, but this situation was changed by the beginning of the conservation programme,” said Vojisoa Radasimalala, a geographer, whose research work focuses on the management of the Nosivolo. Nosivolo is slated to become the first protected area for the conservation of fish in Madgascar. “The process is in progress and will soon be made official,” says Andriamaro.